Why is Trump making his first trip abroad, as president, to Saudi Arabia? Considering his insistence, as a candidate for the presidency, that terrorism is further qualified as “Islamic radical extremism”, and his two attempts, as president, to impose a Muslim Ban, one must ask the question, what gives? Has the White House actually changed the man as some claim? If power that comes with the executive branch of government changes a man, it is unlikely that it changes him for the better. Power often corrupts. It hardly reforms or redeems. If it does anything, it teaches people about the tools that allow them to disguise their true motives: using coded language and diplomatic speak. But for one to truly change from a misogynist, xenophobic, overprivileged bigot to an interfaith messiah of tolerance, one must go through a crisis of the soul. There is no sign that Trump had gone through such an experience. 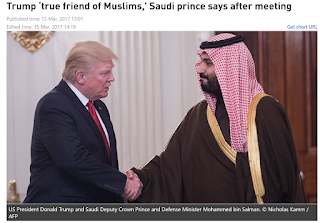 In fact, the choice of Saudi Arabia, the least tolerant country in the world, as his first stop abroad as president, proves that he is the same man he told us he is throughout the campaign. Saudi Arabia, too, is ruled by a clan of misogynist, overprivileged bigots with the ability to turn crude oil extracted from the depths of the desert into trillions of US dollars that’d allow them to write history as they see fit. These despotic rulers, disguising themselves as Custodians of the Two Sanctuaries, ban women from driving cars or traveling unaccompanied by a male relative, deprive Saudi religious minorities, like the Shias, their right to identify themselves as anything except as Saudis, treat foreign labors with forbidding cruelty and extreme prejudice, and mercilessly bomb children and mourners in schools and public halls in Yemen. They warmly welcome the rich and powerful and disdainfully abjure the poor and vulnerable. They befriend elitists and shirk commoners. Their behavior, policy, alliances, and temperament are those of a radical supremacist. Their only contributions to the modern world is a supremacist creed—Wahhabism—and a genocidal band of fanatics–al-Qaeda (and its derivatives such as ISIS and al-Nusra). While the rest of the world has been investing in innovations that save life and the environment, the rulers of Saudi Arabia have been investing in destructive ideologies and military hardware. Such rulers cannot and do not represent Muslims. They represent themselves and the sectarian creed they invented and imposed on any Muslims disguised as Sunni Islam, which is far from it. The similarities between Trump and his entourage and Salman-and-Son define the adage, birds of the same feather flock together. However, the similarities alone do not explain the reasons that make Trump and the Saudi rulers gravitate towards one another. There are important political and economic reasons that drive this affair between the filthy rich rulers of the world. Saudi Arabia needs America’s military protection and diplomatic support. Some American politicians need a special kind of Islam and special types of Muslims who serve two purposes: punching bag when on the campaign trail and a cash machine when in the White House. Trump played the first card on the campaign trail when he made the phrase “radical Islamic extremism” a mandatory refrain of every speech and every interview. He even used that phrase to beat down his political rivals to submission if they refused to include the word “Islamic” in conjunction with any reference to terrorism. Now he needs the cash from the Saudi rulers for protection and for paying for his ambitions. 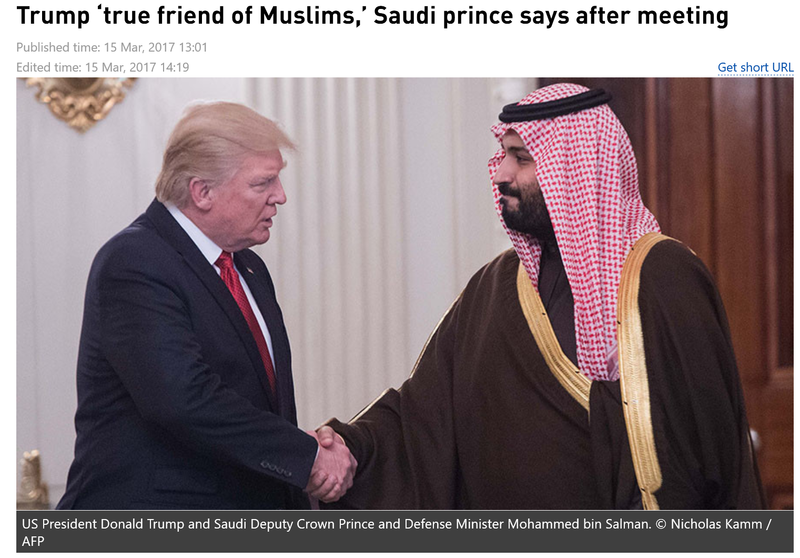 In return he dropped the word “Islamic” from “radical Islamic extremism” and honored them by visiting their country on his first scheduled presidential trip abroad. The cycle will continue nonetheless. In four years, he will resurrect the word “Islamic” to brag about degrading “radical Islamic extremism” in Syria and Iraq and about the hundreds of billions of dollars American companies had made selling weapons to Saudi Arabia to fight its phantom mortal enemies. Four years from now, however, al-Qaeda or some new version of it will be alive still terrorizing and murdering apostate Muslims and deviant Shias in some other Muslim land. Trump and other politicians will continue to preach doom and destruction from this apocalyptic danger called “radical Islamic extremism” and the Muslim countries who did nothing about it. These politicians will continue to use this self-perpetuating myth for as long as people continue to rely on their short memory to construct narratives for themselves and for the “other”. The reason politicians are able to use fear of “radical Islamic extremism” now is because most Americans forgot that it was US administrations—aided by the Saudi rulers—that produced “radical Islamic extremism” in Afghanistan in the 1980’s. The existence of a perverted interpretation of Islam like Wahhabism, which is followed in Saudi Arabia and espoused by al-Qaeda and its derivatives allows many Western politicians, especially the ultra-conservatives among them, to scare the public and then use that fear to get votes to win elections. Trump masterfully played the threat of “radical Islamic extremism” and he rode that wave of hateful enthusiasm to the White House. He promised that he will defeat this threat. But to defeat such a threat, he must know that he needs to crush it militarily and uproot it ideologically. The latter part would require him to confront the Saudi rulers, not elevate them politically. We are, then, left with only one conclusion: The presence of Saudi “Islam” and al-Qaeda is a political and economic profitable convenience. The two must be contained and controlled, but never fully eradicated because they play a critical geopolitical purpose. With this being the case, Trump’s first visit abroad, as president, makes complete sense. Trump’s visit to Saudi Arabia will cost them nearly $1/2 trillion; good economics?